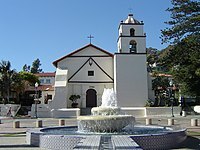 English: Mission San Buenaventura — located near the coast in Ventura, Southern California. Spanish Colonial adobe mission built in 1782, in the Alta California province of the Viceroyalty of New Spain. Media in category "Mission San Buenaventura"